The whole time I was making these christmas wreath cookies I was thinking how the melted marshmallows with green food coloring looked like slime and totally reminded me of ghost busters. 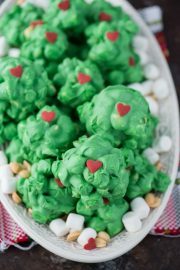 Since halloween was earlier this week (and yes, I am already sharing recipes for CHRISTMAS cookies!) 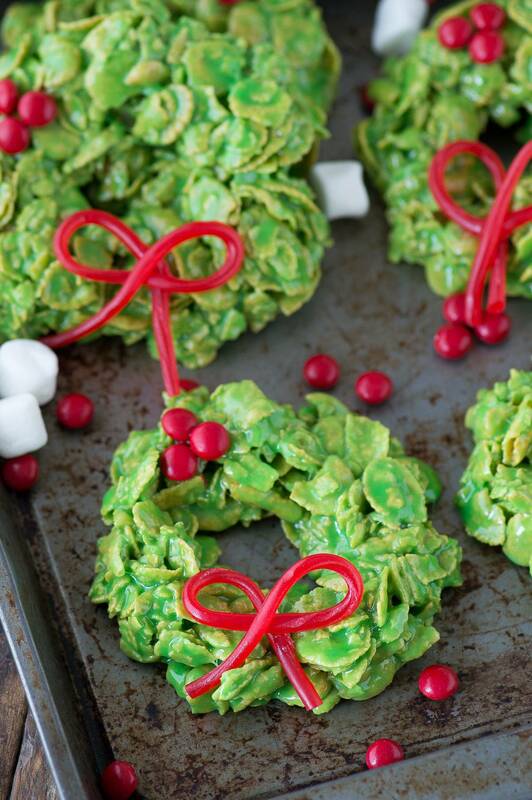 I kept thinking how perfect this recipe would be if you turned the cookies into slimy green monsters with eyeballs. I’ll have to save that idea for next year! 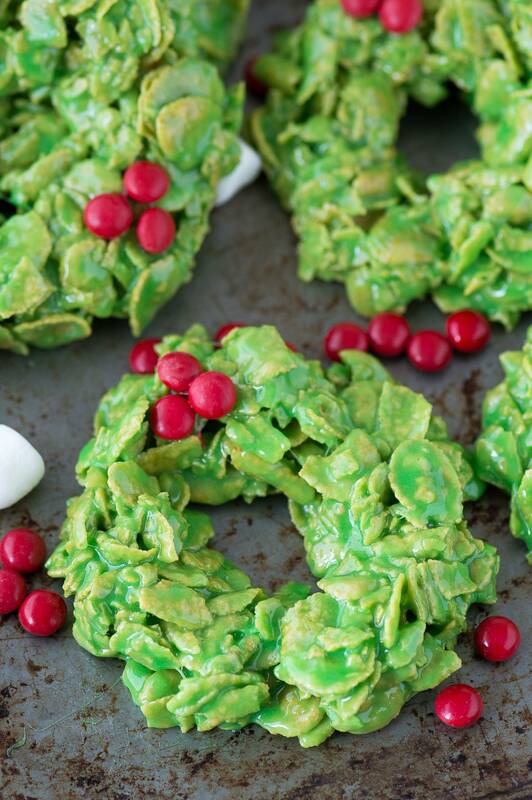 While Christmas Wreath Cookies aren’t new, we’re sharing our easy recipe with you – complete with a 30 second video demonstrating all the steps! See the video right above the recipe box, which is below. I really like using corn flakes to make these wreaths, the texture is spot on and resembles pine leaves. 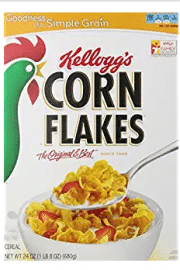 I have heard that some people like to use frosted flakes, which would give you the same look too! 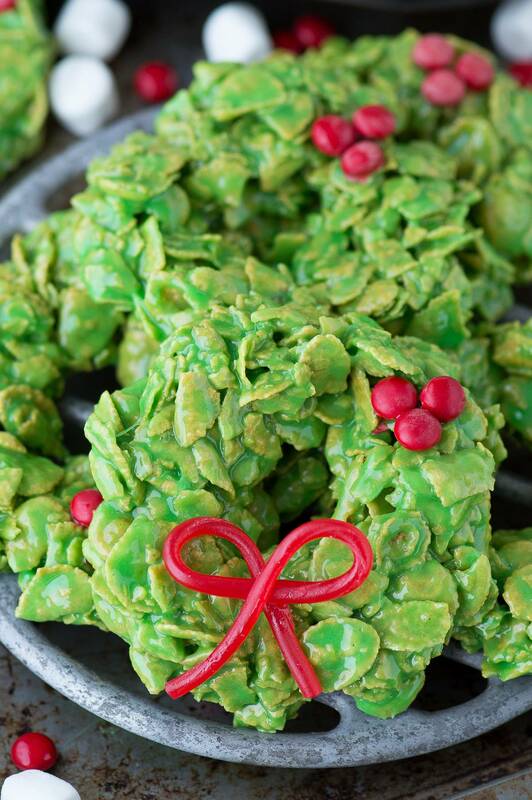 The original christmas wreath recipes floating around in internet-land call for red hots as the ‘berries’ but I’m not a fan of mixing a sweet rice krispie treat with something spicy. 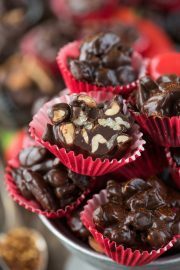 I used mini red coated chocolate candies instead. 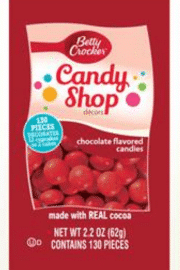 They are pretty much mini m&ms just sold by another brand. I was able to find them in the baking section of the grocery near, near the other sprinkles and muffin liners. 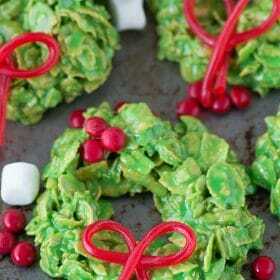 I also added edible bows made out of twizzler’s pull and peels. I took a single pull and peel and formed a figure 8, then cut off the ends of the bow, so they looked proportionate. To form the actual wreaths, I found it easiest to spray my hands with a little bit of cooking spray, then take a handful of the corn flake mixture and form it into a ball. Use the palm of your hand to flatten the ball into circle. Next use your finger to poke a hole through the middle of the circle and reshape as needed until you have a wreath shape. 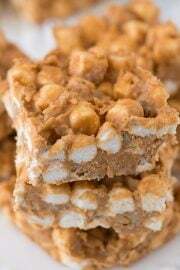 You’ll need to add the chocolate candies right away while the marshmallows mixture is still sticky. Stick them in the fridge to set faster, and store in airtight containers if you won’t be serving them right away. Line 2 baking sheets with silicone baking mats or parchment paper. 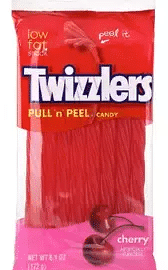 If using twizzler’s pull and peels to make bows, assemble the bows now. You can place a baking sheet on top of the bows to keep them from coming apart. In a medium pot, melt the butter and marshmallows over medium heat, stirring occasionally until the marshmallows are melted. 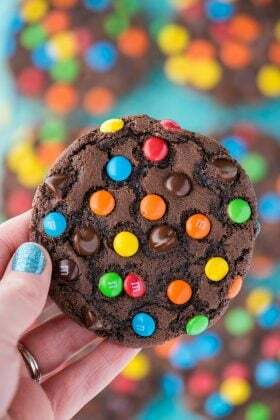 Add in green food coloring until you have your desired green color. 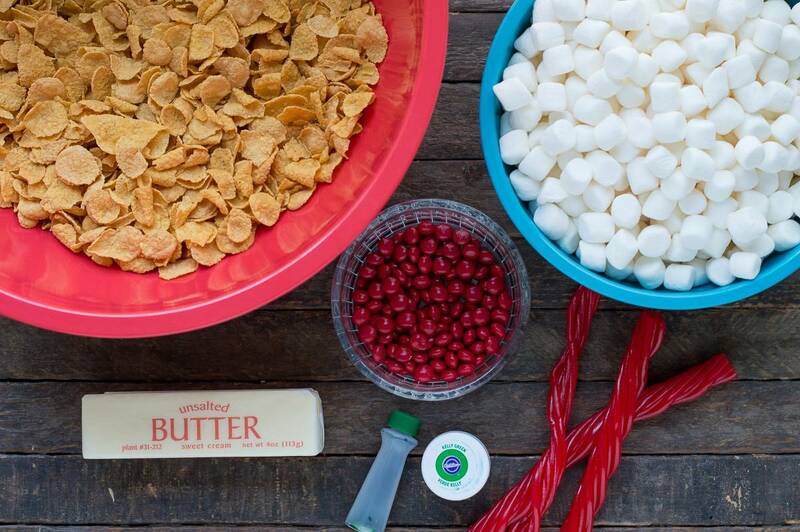 Pour the melted marshmallows over the corn flakes, mixing with a spatula until all the corn flakes are covered. 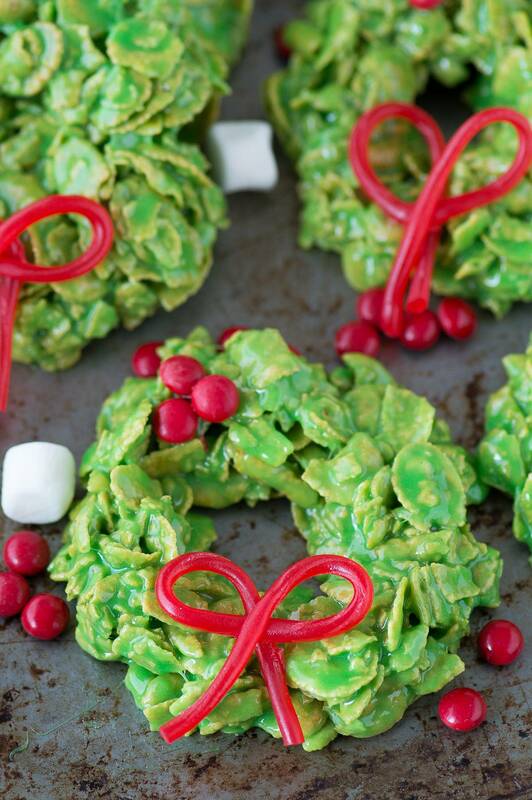 To form the wreaths, I found it easiest to spray my hands with a little bit of cooking spray, then take a handful of the corn flake mixture and form it into a ball. Use the palm of your hand to flatten the ball into circle. Next use your finger to poke a hole through the middle of the circle and reshape as needed until you have a wreath shape. Place the christmas wreaths in the refrigerator for 20-30 minutes to set. Remove from the fridge, serve and enjoy. Store in an airtight container. Hi Dee! I’m not 100% sure – maybe look to see if other people have used coconut oil as a substitution in making rice krispies! Hi Beth! I don’t personally have one, sorry! These are really great for Christmas! I added 1/2 teaspoon of Almond Extract also. Very Good! 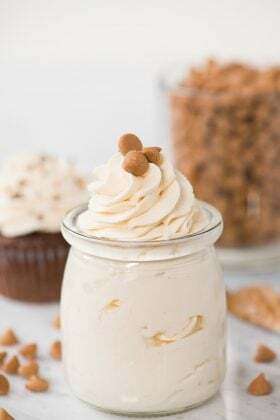 I do love almond extract! Been making these over 40yrs. 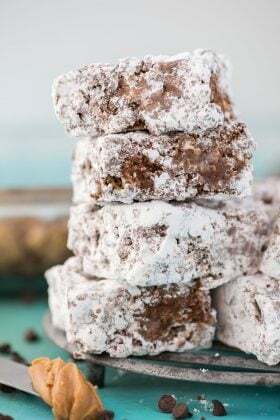 You use 1tsp of green food coloring (looks like a lot but it gives the best uniform color) AND 1tsp of vanilla extract (gives them actual flavor instead of tasting like a greasy marshmallow) add both after the marshmallows have completely melted and pot is off the heat. You can also use 30 regular size marshmallows instead of mini. I also just cover my kitchen table with wax paper and drop the mixture by spoonfuls onto it then poke an oiled wooden spoon handle end in the middle to make the wreath. 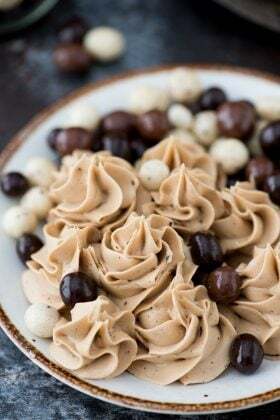 Can you use Vegan Marshmallow fluff instead of mini marshmallows? Hi Deborah! I’m not sure, I have no experience with vegan marshmallow fluff. Report back if you use it!